Summer is travel time for many, whether a long trip or visiting places close to home. Here's a Hot Dog Booklet made from a gathered map or menu. 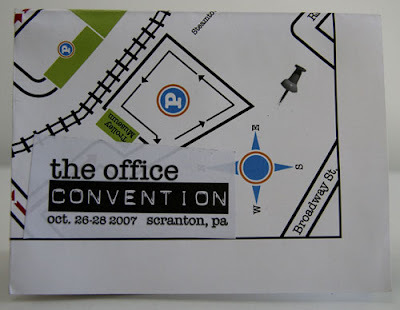 I made my first one when my daughter and I and friends went to the Office (the TV show) Convention in Scranton, PA last fall. They were giving away one sheet maps with festival venues and parking areas. Being the bookmaking-obsessed person that I am, I immediately saw the map folded into a Hot Dog Booklet. I made mementos for all of us with photographs. You can use restaurant place mats, commercial maps that a lot of towns have advertising local restaurants and shops, a poster or flyer from a show. I didn't want to carry around large pieces of paper so on the spot I folded the map the long way like a hot dog, then the hot dog in half and then in half again. The folds were in the right place for the Hot Dog Booklet which I made when I got home. I put the map on the outside (by having it on the outside when I made the first fold like a hot dog) to serve as a background and glued photos to the pages. If you put it on the inside, you'll have the map to refer to if you open up the paper. 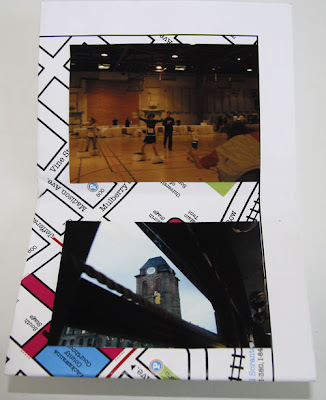 I glued photographs to the pages but you can also glue pages of drawings or writing.